Cabins and Containers is very pleased to reveal our new and improved range of Security Huts, with stock available in just a few weeks. Improving on the previous range of steel security huts we’ve been selling for the last few years, we’ve taken the time to review limitations and respond to client requests, and we’re happy to finally reveal all the details for our new range. Our new security huts are available in three standard sizes, and we always aim to keep these three sizes in stock for immediate despatch, built to our standard specifications. An all-steel construction similar to our steel anti-vandal cabins, our security huts are clad externally in flat-sided steel, and feature 3no. double-glazed aluminium sliding windows and a steel security door with multi-point locking and vision panel. All units are also fully fitted with electrics, lighting and heating, featuring a 17th edition consumer unit, galvanised steel external connection box, double socket and a bulkhead light. All security huts also feature a 0.5kw cold watch heater, except for the 8ft x 6ft model, which is upgraded to a 2kw convector heater. 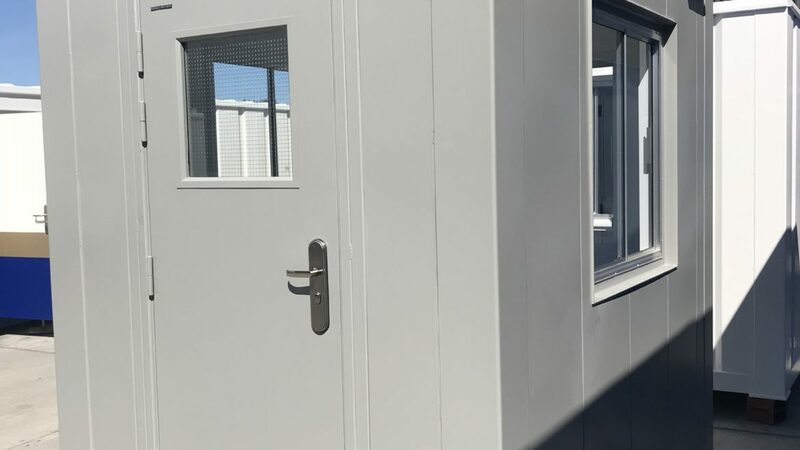 Our security huts are also insulated with 60mm glass fibre to walls and roof, and fully lined internally with wipe-clean vinyl-faced plasterboard in white. The 18mm plywood floor is covered with welded 2mm heavy-duty vinyl flooring in grey while externally, the units feature high-level lifting eyes and are now fitted with forklift pockets due to popular demand. All units we build for stock are painted externally in Goosewing Grey. In addition to these standard sizes, we can also build these units as bespoke items in any size from 4ft x 4ft allowing clients to make any changes to the spec as they see fit, including adding sockets, adding an extra door, internal worktop, alternative external colours etc. Once the units reach about 10ft though, we would refer clients to one of our other ranges to fully accommodate their requirements. We’re expecting the first batch of our new security huts within the next month, so get in touch now if you’re interested.